This red eye remover program allows you to adjust the pupil area and brightness, and preview the results real-time. The program keeps structure of the pupil. After you install Red Eye Pilot, you can see the demo. Run it from the Demonstration menu. Red Eye Pilot is also capable to fix “mis-colored” eyes in photos of pets. It is identical to Pet Eye Pilot. 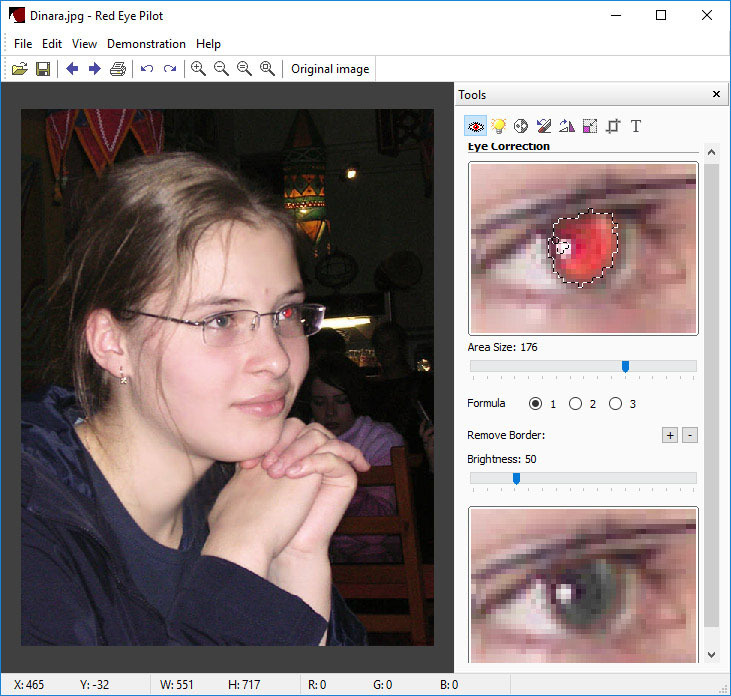 Red Eye Pilot (+Plugin) 3.10.0 (3 Mb) – Windows XP/Vista (32/64), Windows 7 (32/64), Windows 8 (32/64), Windows 10 (32/64). Limitation of the trial version: the software allows you to save the image in a special format (.tpi). After purchasing, you will be able to open your TPI images in the full registered version of the program and save them in any of the JPG, TIFF, PNG, and BMP formats. The program is included in photo software packages at a substantial discount! Technical support via email and upgrades for the first 12 months after purchase are included. If your free upgrade term has expired, you can buy the new version of the program at a 50% discount. + Work with plugins has been improved.